Keyword research in SEO is as important as oxygen in human living. It’s the first step for developing successful SEO for your website. Keywords are also called as search terms. It could be one or more than one word. It helps to get targeted audience for your website through search engine. It is the most important part to choose relevant keywords for your business or blog to reach relevant people. Keyword research means to research & choose words / terms that users will search in search engines for finding their queries. This will help them get related results from search query. This tutorial is part of our Basic SEO Tips and Tricks guide. You are a Lawyer in New York. People who need lawyer in New York will search term like Lawyer in New York and it will find your website and can contact you by Google’s organic search. It might be easy to choose a keyword for a personal website like lawyer. But it is very difficult to choose a keyword for bigger website having lots of information. Like if you choose Amazon or eBay, they have millions of products and each type of product being search in Search engine. In this case company like eBay or Amazon needs to focus on each search term that people will search and they have to choose relevant keywords for their search too. Chosen keyword will be relevant to your website or page. So people and Google both can understand the page topic and Search engine can serve better result. Why is Keyword Research Most Important for SEO? There is a simple logic. Until you don’t know from which word or search term you want to rank your blog post at the top position, probably you won’t be able to optimize images, pages and content strategy to draw qualified traffic to your website. If you have chosen keyword that is not related to your website or niche and you have placed those keywords into your blog post then there is more chance that for short time your blog post may get ranked higher in search. Well, but you may loose traffic and user wont stick to your site as wrong keywords may mis-guide users. Eventually this behavior will be caught by Google SERP and you may loose your traffic and potential user. This scenario will increase your site’s Bounce Rate and it leads to losing your overall ranking. Apparently, it is bad factor for your website and it will increase spam score also. Make sure to choose right keyword for your site. In our case, Crunchify’s article is at top position for Spring MVC tutorial as we have used those keywords in our tutorial. Please make sure you don’t use those keywords directly as Tags or in list in your blog post. Keywords need to be properly mentioned and should be part of your content explanation. Short-Tail Keywords are also known as popular keywords. These keywords contain 3 words or less. WordPress Themes or Free WordPress Themes these are called head terms. It defined the first thing that you think while searching the term on search engine. Similar to that, if you want to search for WordPress plugins then you will go to Google or Bing and start writing search term like WordPress plugin this thing called popular keywords because it contains very high search volume and competition. These keywords contain more than 3 words. They are little different from short tail keyword. It contains low search volume and competition. But because of these factors, it is easy to rank for long tail keyword. You might get low traffic to your website with these keywords but you may get High CPC and Quality traffic. In above example search keyword is Spring MVC. As you see Google also recommends Searches related to Spring MVC. You could use any of above long term keywords which will help your site boost higher for those keywords. If you want to search for theme for news or magazine website then your search term will be like news magazine premium wordpress theme or wordpress theme for news magazine website. 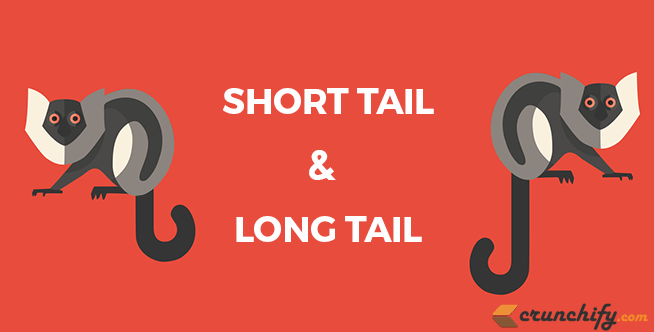 These are long tail keywords which have lesser results then short tail keywords. That’s all in this tutorial. These are the basic informations on keyword. With this you can start keyword research for your blog or website to grow your business and get proper ranking for that keyword. If you have any other information about keyword research and planning then do share with us in comment section.